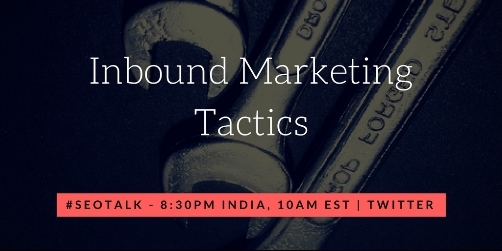 This week on #SEOTalk Twitter Chat, we discussed about Inbound Marketing Tactics. Inbound Marketing has become a key component of marketing strategy for brands across all hues since it is instrumental in them acquiring customers. The term coined by HubSpot relates to mapping customer journey and attracting them rather than going and pitching exclusively. This form of marketing relies on multiple components like SEO, Blogging, Landing Pages, Content Marketing, etc. During the chat, we covered questions from the most basic like definitions to the key elements and finally on how it can be measured. Q1. Starting with the basics, what is inbound marketing? Q2. What are its key elements? Q3. How can B2B vs B2C marketers use Inbound Marketing effectively? Q4. How can SEO play an important role in Inbound Marketing? Q5. What changes on the website should be done to effectively run Inbound Marketing Campaign? Q6. Why is email marketing an important element of Inbound Marketing? Q7. What tools do you suggest to measure impact of Inbound Marketing? Is Inbound Marketing a good tactic?